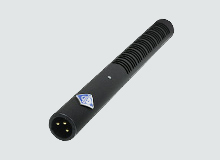 The KMR 81 D is the transition of the well-established KMR 81 i shotgun microphone into the digital domain. namic range, a more robust operation (EMC safe) and the avoidance of clipping as a result of the integrated peak limiter/compressor. The settings for all functions can be recalled, set and stored in the microphone by using one of the digital microphone interfaces. Further information on the digital microphone technology and the whole Solution-D system can be downloaded as PDF.